My marketing firm was very active in the promotion of Youngtown 2010 during the initiative’s nascent days. Along with Gemma Sole, I served as co-chair of its marketing committee and Keynote developed the branding and marketing strategies, including the production of television public service announcements. Sidebar: I was so impressed with Gemma’s passion for the project I eventually persuaded her to come to work for Keynote. Before I became involved in 2010, I will admit I was skeptical. “Here we go again,” I sighed to my wife after reading an early newspaper article on the upcoming initiative. I had been involved over the years in the promotion of a number of ‘feel good’ campaigns for Youngstown: lotsa fluff with no backbone, no purpose, no plan; fun to market with glitzy billboards and a toe-tapping jingle with cloying, Kum Ba Yah lyrics. There would be no long-term results, but none were really expected by the committees involved. As I continued to read on in the article, something unusual did jump out. The list of individuals behind ‘2010’ was pretty impressive: Dr. David Sweet and Mayor George McKelvey (What? The university and City Hall working together? ); Jay Williams, CDA Director; Hunter Morrison, an experienced and successful city planner most recently from a similar project in Cleveland ; and two young guys from the City Planning Department, Bill D’Avignon and Anthony Kobak. Maybe this was going to different. Maybe this was a real plan. Maybe I could help them market this. I made a few calls and volunteered my services. It was clear from the beginning that success of ‘2010’ was going to be dependent largely on its acceptance by the people of the community; making marketing, in particular brand identity, a vital component. The marketing committee and Keynote, I believed, were up to the task. This did, however, have many of the earmarks of a ‘tough sell’ -- especially to the likes of Boardman, Poland, Austintown, and beyond. Although Youngstown 2010 would directly affect The City, the impact and importance of 2010’s Vision for the Future went beyond the ‘Iron Curtain’ that paralleled Midlothian Blvd. and Meridian Road. The planners understood that this would affect the suburbs in very real way, a very positive way. The citizens' understanding and acceptance of the ‘vision’ was equally important. Their historically low tolerance to anything ‘Youngstown’, however, was legendary. Even though I lived and worked in Boardman, I was a staunch advocate of The City of Youngstown and, more specifically, a strong and vibrant central business district. As Mayor Williams stated in a recent speech at a Regional Chamber breakfast, the region is a ‘body’ and the City of Youngstown is its ‘heart’; a body’s overall wellbeing is almost totally dependent on the health of its most vital organ. Sidebar: Considering the lackluster support of 2010 from the suburbs coupled with the ongoing JEDD controversy, I believe a brain scan for this particular body may be in order. The first order of business was to ‘sell’ the initiative to the citizens of The City. After all, they were the stakeholders. This was going to be their plan for their future and the future of their children and grandchildren. We wanted them to act, to get involved in the process of creating this plan. We weren’t selling the plan as much as were selling the importance of their involvement in the plan. We put in place the elements necessary to compel them to act, after all that’s the purpose of marketing, isn’t it? To get your target audience to get up off their rear ends and buy or do something? First, a Youngstown 2010 logo was developed along with the positioning statement "A vision for the future." We incorporated this into a brochure, a billboard campaign, a website, and a television public service announcement. Specifically, the marketing effort in this case was to get citizens to attend neighborhood meetings at which they could express their issues -- damaged sidewalks, abandoned properties, lack of recreational facilities, etc. -- relative to their neighborhood. Information gathered at these events would be used to formulate a citywide plan. We got the desired result. People turned out and participated in designing a better future. Hunter Morrison later told me that the public participation in Youngstown far exceeded that of the Cleveland initiative. The marketing committee was elated. I am confident that success was due in part to how we positioned ‘2010’ -- not as a dry document packed with statistics and maps, but as a virtual roadmap to the future for the people of the community. In fact, the TV spot we developed never even mentioned what the initiative was all about; only that it was important for YOU to get involved. We utilized no announcers, just Youngstown citizens telling everyone that "The future of Youngstown is in your hands." 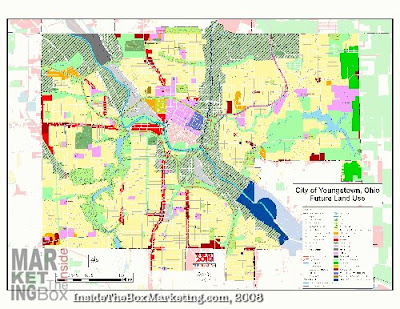 In April of 2007 I had the honor of attending an awards luncheon in Philadelphia where Youngstown 2010 was awarded top recognition in the area of "Public Participation" by the National Planning Association. Youngstown’s chief planner, Anthony Kobak, and I were also selected to present a seminar at that convention as well as at an earlier regional gathering in Cincinnati. The marketing component of ‘2010’ has been cited by numerous national and international publications, including Barbara Faga’s book "Public Participation and the Planning Process." I have long held that branding and well-conceived marketing strategies cannot and should not be limited to commercial entities. It is just as important for public institutions and programs to inform and motivate the people whose lives they help shape. It is my belief that the promise of Youngstown 2010 has a better chance of ultimate success because of the understanding by its leadership of the importance of marketing, and in particular, branding.